The StorageFolder class is used for reading and writing data to a file within the local folder. When you work with files, you also typically use the StreamReader class to read and write content to the file. Creates a directory in the local folder. Asynchronous method creates a file in the local folder. Retrieves a stream for reading a file in the specified folder. Retrieves a stream for writing a file in the specified folder. 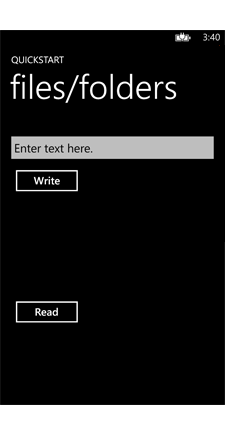 The following image shows a sample app that demonstrates reading and writing text data to the local folder. To create this UI, in the MainPage.xaml file, replace the Grid named ContentPanel with the following XAML. To work with files and folders using the code in this quickstart, add the following directives to projects created from the Windows Phone App template. Place these using statements at the top of the MainPage.xaml.cs file. The following code shows how to create a folder and write to a text file. A file named DataFile.txt and folder named DataFolder are created if either of them don’t already exist. The file and folder are created with the CreateFileAsync and CreateFolderAsync methods. The CreationCollisionOption enumeration is used to specify what to do if the file or folder already exist. // Get the text data from the textbox. // Get the local folder. // Create a new folder name DataFolder. // Create a new file named DataFile.txt. // Write the data from the textbox. The following code shows how to read the text data. // Get the DataFolder folder.